Mole is awesome sauce. Mole can be intimidating. Mole really just means “sauce” and in Mexico, mole encompasses a wide range of different flavor profiles. Outside of Mexico, it usually means mole poblano, which is a thick chili-based sauce with as many as 30 ingredients, and can take days to make. Home cooks can be intimidated by unfamiliar ingredients and the daunting task of a sauce taking so long. Enter, Weeknight Chicken Mole. This recipe originates with my sister-in-law, and is very forgiving of adjustments to personal taste. For a quick weeknight meal, make the sauce, serve it over a rotisserie chicken on a cheesy, warmed corn tortilla, and top with cilantro or some crumbly queso fresco. 2 Tbsp Olive Oil, or enough to cover the bottom of a heavy stock pot. In a heavy stock pot, heat oil over medium-high heat and add onions, cooking until soft- about 5 minutes. Place garlic, chili powder, cocoa and cinnamon in a bowl to the side. When onions are soft and starting to color, add spices all at once, stirring continually for about 30 seconds until fragrant. Add broth and bring back to simmer. Add peanut (or other nut) butter, tomato paste, raisins and chipotle pepper with whatever adobo sauce is on it. Reduce heat to low, cover and simmer 10-20 minutes. While sauce is simmering, prep chicken, and place corn tortillas sprinkled with cheese on a baking sheet into a warm oven to melt. 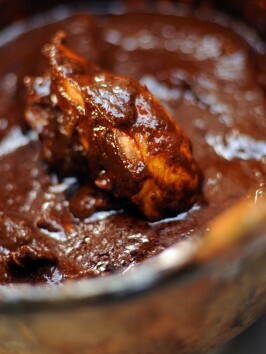 With a stick-blender, puree the mole sauce on the stovetop. If you don’t have a stick-blender, you can leave it bumpy, or run it carefully through a blender in small batches to achieve the traditional smoother texture. Be careful with hot liquids in a blender- or use your food processor. Add the chicken to the sauce in the stockpot. Turn and stir to coat all the pieces, and serve on over the plated, warmed, melty cheese tortillas. Top with cilantro, queso fresco or a drizzle of sour cream. Also always good: rice and beans. And there you have it. It’s actually kind of shocking how good this tastes for something so quick and easily made from your pantry and a rotisserie chicken. Return and report how you like it! Thanks to my sister-in-law, Erin, for sharing this one. Dinner. Tonight. I must make and consume this. I will return and report. Mole is made. I am addicted. We’re having it tomorrow! So just to be clear, you don’t cook the chicken in the sauce? Nope, did not make the chicken in the sauce- first time I made it, I bought a rotisserie chicken and just tossed it with the sauce. The following times, I have cooked the chicken separately and shredded it, then added it to the finished sauce. Once, I made the chicken, didn’t add it to the sauce at all, placed the chicken alone on tortillas with cheese, the ladled sauce over the whole thing. Super versatile, and still insanely good, regardless of manner served.